Last Call ~ June SFYTT!! Okay peeps! Last week to get in on this months SFYTT!! 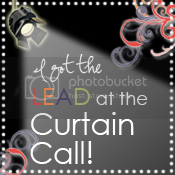 All submissions are due by midnight EST on Saturday night! Here's the sketch! SOOO many options with this sketch! Just have fun with it:) Here's another card I created with this sketch! The ribbon is from Hobby Lobby and can I just say...is the most wonderful grosgrain ribbon I've EVER used! I was a PTI ribbon fan, and still am, but if I could find this ribbon in every color from Hobby Lobby I'd be a convert, haha! It's sooo soft and buttery, tying bows is SO easy with this ribbon! I need to go back and get some more ASAP! 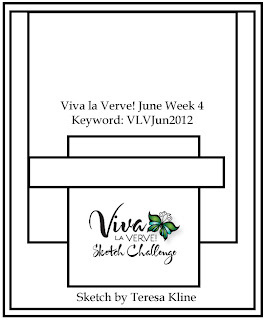 Viva la Verve June Week 4 - You make a difference! It's Viva la Verve day, girls! How about a sketch to start your weekend off on the right foot? Here's our sketch this week from Diva Teresa! This was such a fun sketch! I hope you can play with us:) Here's my sample! 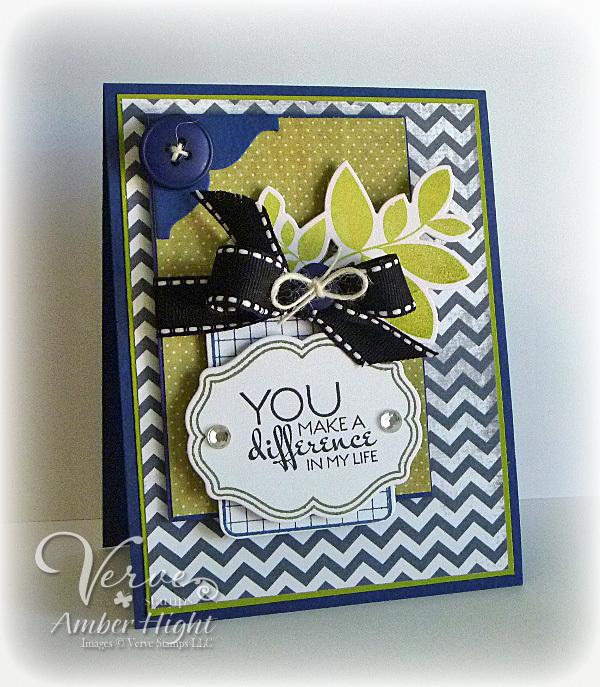 I used a bunch of different Verve goodies on this card! This is such an unusual color combo for me but I love how it turned out! The sentiment and leaves are from Bloom and Grow. The leaves were cut out with the corresponding "Elegant Leaves" die! This is seriously my favorite die in the world, hehe:) You can also see the grid tag in the background, that stamp and the label stamp are from Tag Time and the coordinating dies are the Tagged Rectangle and Curvy Bookplate dies. That's it from me today! Come play with us HERE! 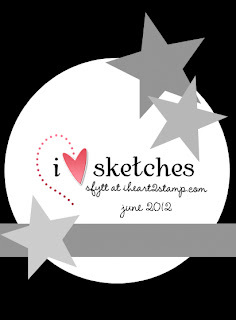 It's the last week to get all your June sketches submitted! The grand prize is HUUUGE! $100 gift certificate to the Verve store!! All for playing with your stamps:) Good deal! Good morning! Are you ready for a sketch to play with today? 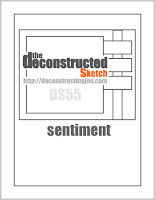 Well, we just happen to have a new Deconstructed Sketch for ya! Isn't that a fun sketch? 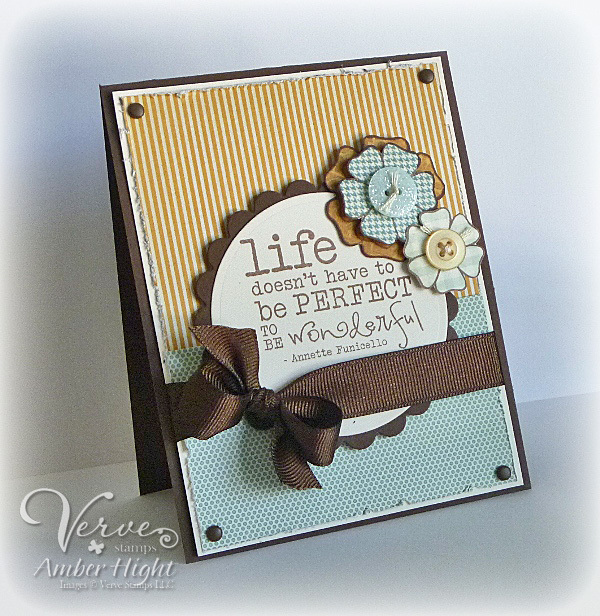 Here's my sample with a new Verve Plain Jane! I'm not sure why the picture is so grainy, but I had to take it at night, so maybe that's why? Who knows, haha! 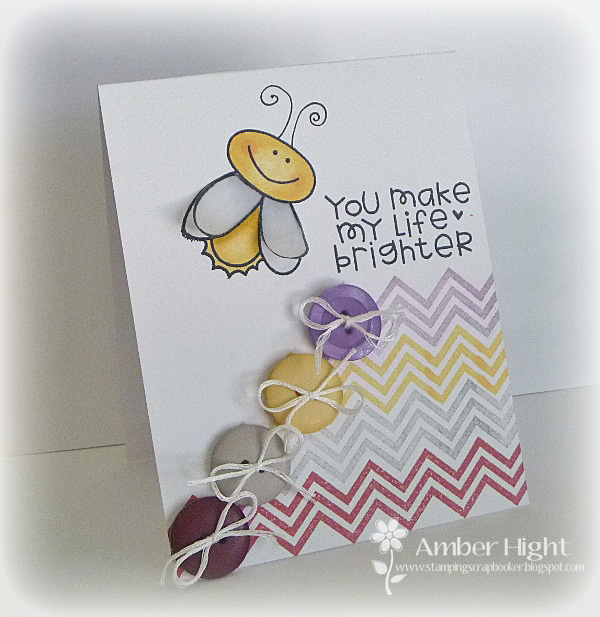 This is one of the cards I made while cropping with Kim the other day! 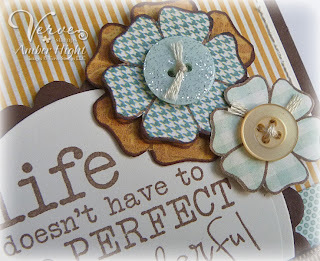 I used papers from MME, some buttons and ribbon from PTI, and the oval stax from MFT (for the sentiment). 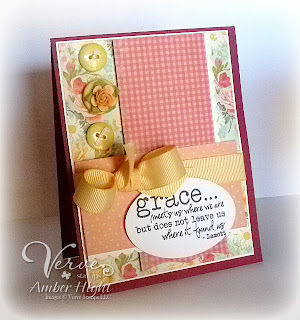 As I mentioned, this sentiment is a new Plain Jane from Verve, called Grace! Check out my lovely teammates and see how they've used this sketch! SC390 and a Sparks card! Hello! Long time no blog:) We were in Virginia Beach for a week and got back on Saturday, and my mojo has been in hiding! HOWEVER, I went over to Kim's house yesterday and we stamped the day away! I told her she's good for my mojo, haha! I got three cards made while I was there which is really odd for me. If I'm cropping with friends I never get anything done! I'll have those cards up throughout the rest of the week. 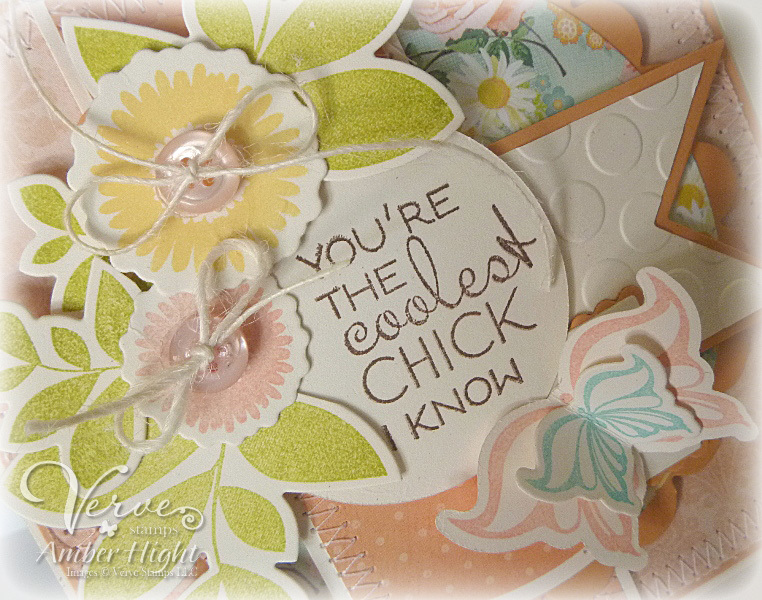 I had all afternoon to play with my new Paper Smooches stamps (I got to shop IN the Paper Smooches store, how awesome is that? Talk about jaw dropping!) 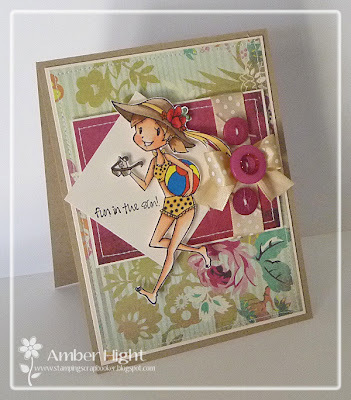 I got a card made for this weeks sketch challenge on SCS and also the Paper Smooches Spark challenge for the week! First up is my SCS Sketch Challenge card, using Paper Smooch "Summer Groves"
I stamped the big, billowy tree once on patterned paper and again on Chocolate Chip cardstock and cut the pieces out. This tree would be so fun to stamp on several different pieces of pp and make a very pattern-y tree:) When I stamped the sentiment, I didn't think it would be that big (but OH how I love big sentiments:), so I had to stamped it on the oval piece too, I think it adds a fun little detail. 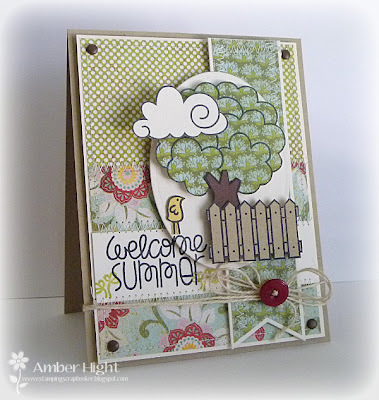 The fence, bird, clouds, and sentiment also come from the Summer Groves stamp set. There is also a Spring Groves set, and I can't wait for the fall and winter sets! I seriously love tree stamps. Seriously. Oh, and Kim's handwriting! :) I'm telling you, this is going to be a new obsession of mine, I need all the PS stamps! Next up is my card for this week's Sparks challenge! This week is a "Cool Shades" challenge and here are the colors for the week! This card turned out MUCH differently than I had planned! I was going for a clean, graphic card, but once I decided on this sentiment with the chevrons, I wanted to add the lighting bug and buttons! I also cut out some vellum wings for the bug, it's so cute IRL! I also drew the antennae on. 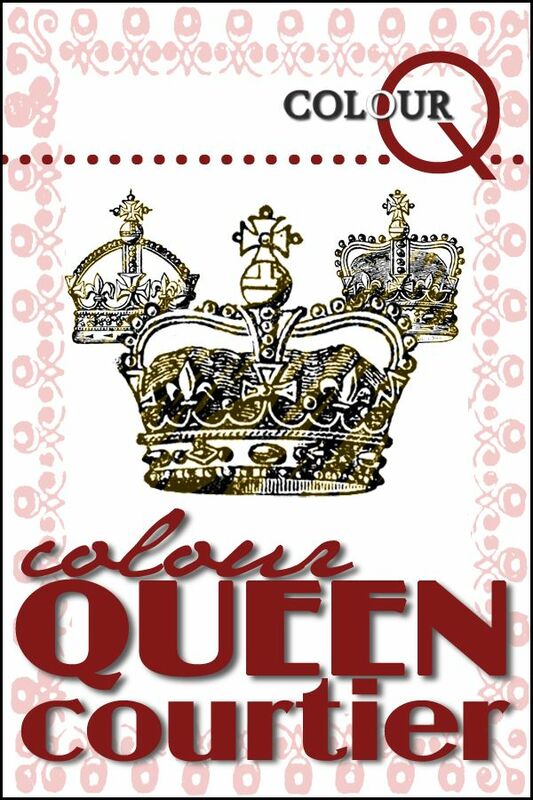 The colors I used are Rhubarb, Gray, Silver Lilac (Memento), Harvest Gold (PTI). I think they're pretty close to the challenge colors anyway, haha! Well that's all I have today, I'll be back tomorrow! How cute is she? Oh yes...I'm hoping to be in my bathing suit (although it might not be an itsy bitsy teensy weensy yellow polka dot bikini!) allllll week long! I used some Basic Gray papers on this card, and this week's Deconstructed Sketch for the layout! Check out what the rest of my Deconstructed Sketch teammates have done with this sketch --->HERE!!! Be sure to visit all rest of the SCRS designers for more peeks of Beach Chloe. Sparkle will be giving away Beach Chloe to one lucky person! For a chance to win, you need to comment on all of the designer's blogs (list below). Then head on over to the SCRS blog and comment on the Chloe post. You have until midnight EST each day to comment. The lucky winner will be announced the following day! Thanks for visiting today! Make sure to check the Sparkle Creations blog again tomorrow for a peek at the new Karber set being released! It's SOOOO ADORABLE! Hello! The 5th of every month, the Inspiration Diva's at Verve have a lovely hop to showcase older stamp sets and give you a little inspiration on how to use them! This month, we are also releasing two new Plain Janes!!! FUN STUFF!!! I have a card I made today using last week's Mojo Monday sketch! LOOOOVE this sketch! I kind of combined the two options! I didn't use one of the new Plain Janes on this card, but I used a TON of Verve goodies! The sentiment is from Chicks Rule, the big butterfly stamp is All Aflutter PJ, the small one is from Twitterpated, and the blooms and leaves are from Bloom & Grow and were cut out with the Floral Circles die and the Elegant Leaves die. 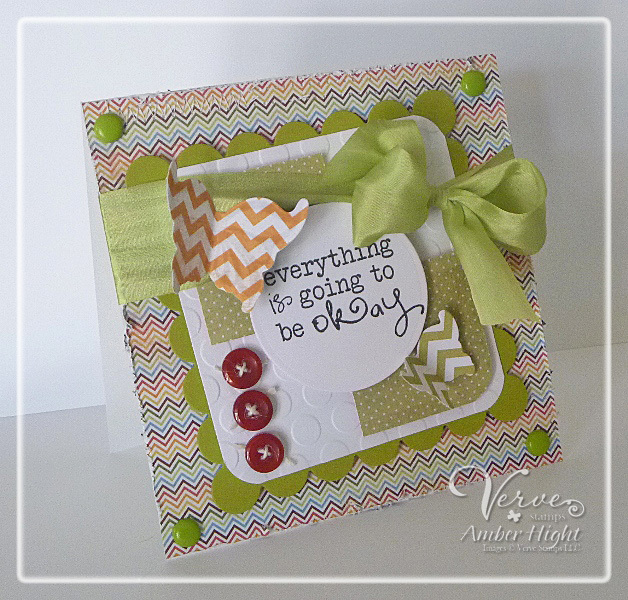 You can also see the Ribbon Banner die behind the circle sentiment! The papers are Howdy Doody from MME. Now go visit Amy and see what beautiful creations she has to share with you!!! Hello! 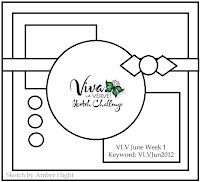 Today is the beginning of a new two week challenge from Sparkle Creations! This week, our challenge is a sketch! Here's my card using the newly released "Expecting Emily"
The papers are from MME and I stamped the sentiment (that comes with Emily) on tags cut using Verve's scalloped tag dies. I kept this one pretty simple! 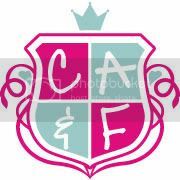 Now go visit the Sparkle Creations Blog to see what my teammates have got to share with you! Thanks for stopping by today!! I had an amazing time last night with Jen and Kim, we went to dinner and then went with Kim's husband and Dad to a little bar for drinks. I haven't laughed so hard in quite awhile! We didn't take any pics though, boo! The papers are from On the Bright Side by MME. I love the fun chevron patterns in this pack! I tilted my main image panel because...well I just like the interest it adds! 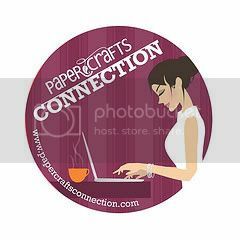 I got that beautiful ribbon from Sharon's Stamp Simply ribbon store, it's so gorgeous and soft! Need to get more! The sentiment is Verve's Be Okay Plain Jane. I also used my All Aflutter dies. You can't really tell, but I clear embossed the All Aflutter PJ on the largest butterfly die. You can tell IRL, but it didn't really come out in this picture. 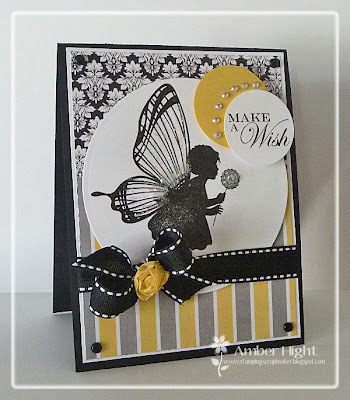 I used Butterfly Kisses from The Crafts Meow for my card, I just *love* this image! I added lots of stickles to the wings and dandelion, it just didn't come through in this picture. 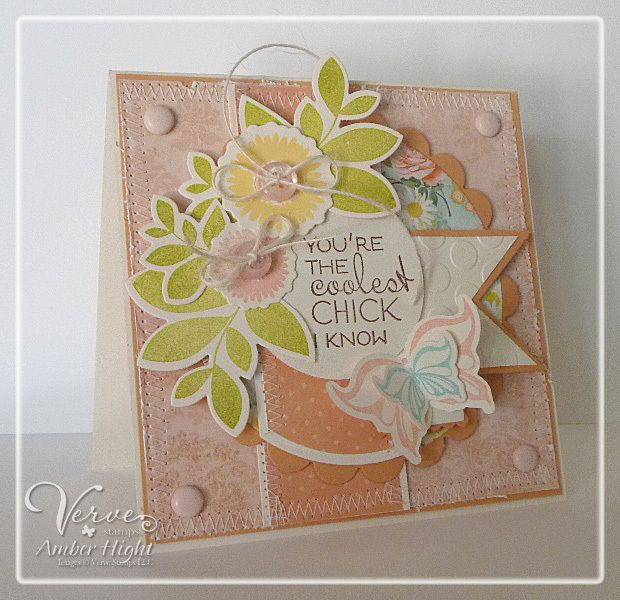 The papers are from Carolina Breeze by MME. We do have a fabulous sponsor this month! I just didn't get my order in on time, darn-it! But the rest of the girls did so make sure you check out their blogs before you leave! Our sponsor for June is Lil Inkers! They have the most adorable stamps and dies, very cool! Now make sure to check out my teammates blogs! They've got lil inker fun to share with you:) Thanks for stopping by today!